Moringa: One Of The World’s Most Abundant Sources of Vitamins And Minerals.. In the tropics of planet Earth grows nature’s answer to the multi-vitamin pill. Moringa oleifera, the tree of life, has earned a growing reputation for its miraculous nutritional and medicinal properties. Moringa is originally from northern India, but, as word spreads of its benefits, cultivation is expanding across Asia, Africa and Latin America. According to Trees for Life, moringa oleifera and its cousins are used in traditional medicines to treat an astounding variety of ailments. Indians use it for treating high blood pressure, while ancient Egyptians applied it topically to prevent infection. In the Caribbean, moringa is used to treat warts in Aruba and eye infections in Puerto Rico. Nicaraguan practitioners use moringa buds to sooth headaches, while doctors in Senegal prescribe it to treat weakness and dizziness. The tree boasts an almost-unbelievable nutritional profile: A serving of fresh leaves contains 7 times the amount of vitamin C in the equivalent amount of oranges, 4 times the vitamin A of carrots, 4 times the calcium of milk, 3 times the potassium of bananas and twice the protein of yogurt. It also contains measurable amounts of vitamins B1, B2 and B3, chromium, copper, iron, magnesium, manganese, phosphorous and zinc. In addition, moringa has all essential amino acids, which are the building blocks for our cells. Dried leaves pack the vitamins even denser, with 25 times more iron than spinach; 4 times more protein than eggs; 10 times more vitamin A than carrots; 17 times more calcium than milk; and 15 times more potassium than bananas, according to the Imagine Rural Development Initiative. In a recent study, the World Vegetable Center in Taiwan compared 120 types of food and found that moringa had the highest nutritional content of all. That means that the tree can go a long way toward making up the nutritional deficits present in many developing countries. Families can eat the leaves fresh, or grind them into a powder for storage and later consumption. And it’s not just the leaves — every part of the tree is useful. The roots act as a stimulant and are used in certain traditional medicines. Seeds are high in oleic acid, can be used to purify water and are a promising source of biodiesel. The bark, pods, gum and flowers all have additional medicinal uses. Furthermore, moringa trees are able to grow in poor soils and require very little water, meaning they can thrive in arid environments that are unsuitable for other nutritionally-rich foods. It grows quickly, and leaves can be harvested months after planting, and up to seven times per year subsequently. Since the leaves grow year-round, they can provide crucial nutritional relief during dry seasons when other crops are not available. The benefits go on and on. Tests have shown that pregnant women who regularly consume moringa recover from anemia faster and have babies with higher birth weights. Children who eat it show increased weight and improved health. Moringa is also good for livestock, increasing the weight and milk-production of cattle that consume its leaves, according to one study. It can even be used as a spray to enhance the growth of other crops. To empower the people of Malawi, Africa to implement sustainable, community-driven solutions that promote human advancement. MORINGA IN MALAWIDetermined to Develop focuses on issues affecting the poorest of the poor in Malawi, Africa. We focus on programs supporting education, orphan care, women’s empowerment, health and the environment. The majority of our effort and funding is spent on education with a focus on those who are orphans and for whom education is the light at the end of an otherwise hopeless tunnel. Most especially, our Malawi based charity emphasizes girls education in the continuing pursuit for gender equality in Africa and the world. Malawi is nicknamed “The Warm Heart of Africa” by both locals and visitors for its friendly spirit and welcoming people. But behind the smiles and eternal optimism of its culture, Malawi is one of the poorest places on earth. Malawi, a landlocked country located in southeast Africa about the size of Pennsylvania, presents a number of challenges for its youngest citizens and their families. Malawi is home to an estimated 6.8 million children (Unicef) and poverty continues to be chronic and widespread. The country’s development is thwarted by a fast growing population, limited arable land, natural disasters, food insecurity, malnutrition, AIDS and a high incidence of malaria – one of the leading killers of children in Malawi under the age of five. Malawi is one of the poorest counties in the world, ranked 170 out of 187 countries on the Human Development Index (UN 2013). According to the United Nations, Malawian people as a whole, live on less than $1 US a day. This includes around four million children living in poverty (UN 2013). Poverty hits children the hardest and threatens their most basic rights to survival, health, nutrition, education and protection from exploitation. Tens of thousands of children, particularly in rural areas, face unimaginable living conditions. They remain without access to running water, decent sanitation and medical facilities. Malnutrition is devastating and the single biggest contributor to child death in Malawi (unicef). Malawi is heavily affected by the HIV/AIDS pandemic and the risk for a child to lose parental care is comparatively high. Tens of thousands die each year because of AIDS. The HIV prevalence rate is more than 11 percent and over 1,100,000 people in the country are living with the disease (UNAIDS 2012). The extent to which the disease affects the country’s children is beyond compare. More than half of Malawi’s estimated one million orphans, 770,000 children in Malawi, have lost one or both of their parents to HIV and AIDS (UNAIDS 2012). SUPPORT OUR MORNING MEAL PROJECT IN MALAWIWe want to use moringa to battle malnutrition in Malawi, Africa. We have funded 1 year of a nutrition program that will provide meals using moringa to 700 children every day at primary school in Chilumba, Malawi. We need your help to fund our moringa project for a second year. Malawi is a developing country facing many issues. Two major problems in this country are malnutrition and education. UNICEF reports 46 percent of the population has stunted growth by the age of 5, 21 percent are underweight, and 4 percent are wasted. In addition, there is a prominent nationwide Vitamin A deficiency, which creates problems with immunity. Additionally, 74 percent of Malawians do not complete primary school, which is the equivalent of grade school in the United States. We will feed these children at a primary school in Chilumba, Malawi so that they can learn, grow and achieve. These children will learn while they eat. We will battle malnutrition by using an additive called moringa in the meals. Locally grown and selected for sustainability, moringa is a rich source of vitamins A, B, and C. Moringa also contains a large amount of calcium, iron, and protein. 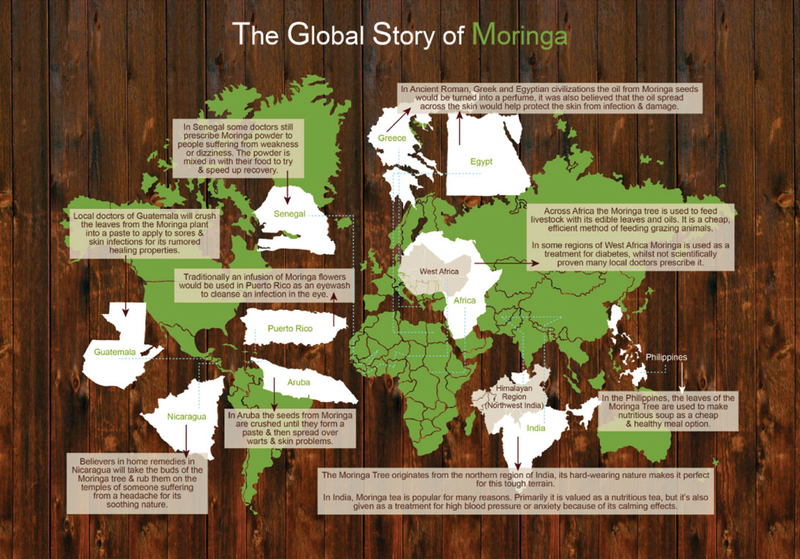 Our goal is to provide one meal containing moringa to 700 children at school every day. No donation is too small and all help is greatly appreciated. A gift of just $11 can feed one child for an entire year. Deforestation and degredation of the environment in Malawi is an issue that Determined to Develop and the local community are addressing through our reforestation project. The project continues to move forward, and more seeds are being planted to improve the environmental health. Six types of tree are currently being planted including the acacia, which is used for home canopies/shade, and moringa, which has nutritional benefits. So far it has been observed that the moringa tree grows very fast and survives easily during the hot season. Once ready, the seedlings will be distributed to kids from the local primary schools to care for. If you are unable to make a fiscal contribution, we urge you to help us complete our mission by spreading the word about moringa and sharing our story. SPONSOR A CHILD IN MALAWIDetermined to Develop assists with living expenses, school tuition fees, uniforms, shoes, learning materials, clothing, hygiene items, transportation and medical expenses for children – primarily orphans – in Malawi, Africa. Through your generous donations, our Malawi charity has assisted more than 300 children who otherwise would NOT have received an education! While primary school (grade school in the US) is free in Malawi, costs such as uniforms, pencils, notepads and shoes often prove too great for struggling subsistence farmers and make even free primary school unaffordable for many families. Secondary school (high school in the US) is not free and school fees (around $20 US per month) are unaffordable for the majority of families in Malawi. Although secondary school education remains a basic public service in many counties across the world, millions of children in Malawi, Africa will never have the opportunity to experience a high school education. This is why ourAfrica charity focuses the majority of our efforts and funding on education. Many of the children in Malawi assisted by Determined to Develop are provided with permanent housing and live within a family environment. $50 a month or $600 a year covers a child’s living expenses, including: school tuition fees, school uniforms, learning materials, transportation, clothing, shoes, food and medical expenses. For less than many people spend on coffee in a month, you can sponsor a child in Malawi. Our needs are immense and sometimes overwhelming, but it’s through small steps that we work to make our world a better place. It’s only through your generous support that our Africa charity is literally able to save lives. If you are in the position to help your brothers and sisters in Malawi, who are far away but close at heart as part of the one human family, we ask that you answer the call and sponsor a child through Determined to Develop today. Sponsorship includes letters, pictures, emails and direct communication between you and your sponsored child in Malawi. There are many Malawi charity projects, but through low overhead costs, the close relationships we’ve developed with the Malawi community & a mostly volunteer staff, Determined to Develop can make your donation go farther than other charities in Africa. All donations are 100% tax deductible and we’ve partnered with Network for Good to securely process your PayPal or online credit card donation. Please help our Moringa Meal Project today! Weekend SALE Buy 2 packs of Moringa capsules get 1 FREE! Supercharge your day with Healing Moringa Tree Moringa capsules. fast and easy way to take Moringa on a daily basis.